Eva Eylers is an architect educated at the University of Fine Arts in Hamburg (Diploma), and at the Architectural Association (MA/PhD, funded by the German Academic Exchange Service, DAAD). She has taught at the AA and the University of Brighton and is currently teaching at the University of Applied Sciences, Trier, and The Bartlett, University College London. 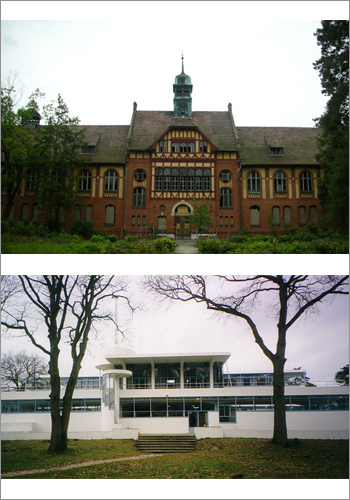 Using this specific building type as an analytical device, and considering the medical and psychological conditions posed by the modern metropolis – of which the sanatorium is a product and a response to – this research discusses how the tuberculosis sanatorium provided a cure not only against TB, but against diseases associated with the experience of the city. The research is approached through a number of case studies (the Zonnestraal sanatorium, Netherlands; the Paimio sanatorium, Finland; the Beelitzer Heilstätten, Germany) in order to investigate both the development of the building type and the design and the reality of the built form.